Because of my work on the recent Cetiosaurus petition, I’m on the ICZN mailing list. Apart from the brutally technical threads on specific nomenclatural cases, the favourite topics of that mailing list are electronic publication and in particular the long-term preservation on anything not printed onto compressed plant matter. In one such recent discussion, the LOCKSS system came up as possible solution, and I found myself replying with what quickly became a tangential rant. Here it is, in lightly edited form, for your amusement. LOCKSS is a complete red herring here. Although the project acronym — Lots Of Copies Keep Stuff Safe — implies that it’s all about replication, the project really exists to keep published work locked up — to prevent people reading it, keeping it hidden away to be opened up only in the event of something catastrophic happening like the publisher going out of business. The reality, as we surely all know from our interactions with our colleagues within our own subdisciplines, is that everything that gets published and made available in electronic form is already replicated in lots of copies; and those copies are distributed far more widely than a monolithic system such as LOCKSS could ever achieve. Not only that, but the distribution requires (and has) no funding: individuals do it because it benefits them and their friends. I know that for-profit publishers have reasons to pretend that closed-access publishing is still possible, but there is no reason for the rest of us to be blinded by that fantasy. The ship has sailed, the genie is out of the bottle, the can is open and the digital worms are everywhere. Everything is open access. Whether a publisher makes a PDF freely available or not, it is freely available to anyone who wants it — that’s the way it is in 2009, and nothing that anyone does can change that. We can and should plan on the basis of reality, not on the basis of either history or of a publishers’ delusions. So: the PDFs are out there, and will stay out there. Assuming that every personal computer in the world and every backup store isn’t simultaneously destroyed (which could only happen under circumstances that left us with much worse problems than nomenclature), what could happen to make us lose the accumulated literature available? Software rot? Some people worry that the software that reads PDFs will decay so that all our PDFs become useless. Sorry, but that is another red herring. It is true that Adobe may at some point stop supporting their particular PDF-reading program, Acrobat. But that really is not important: the specifications for PDF are open, and there are many, many implementations of those specifications, including half a dozen open-source PDF readers that I could name off the top of my head. While there is a demand for them (i.e. while there are PDFs), these will never go away — and for the same reason the PDFs themselves will never go away: because they exist in hundreds, thousands of copies — quite likely millions, given that these readers tend to be distributed as part of operating systems. Again, please understand: it simply does not matter if a particular proprietary PDF-handling program goes away, because the knowledge of how to read PDFs is itself distributed. That knowledge is in the public domain. (PDF was recently ratified as ISO 32000-1:2008). Lots Of Copies really do Keep Stuff Safe, and they don’t need LOCKSS to do it. So where are we? We have PDFs, which will always be readable — and perhaps successor formats, which will also always be readable for the same reasons. We have PDFs-reading programs, which will also always be available. Both the publications and the software are distributed literally globally on a network which was designed to survive a direct nuclear strike. Folks, it’s over. The digital revolution has happened. There is absolutely no rational reason in this day and age not to accept digital publication; in another ten years, the ICZN is going to look stupid for even having discussed this. And let’s hope they’re still around in ten years to feel dumb — because if they’re still insisting on paper, they’ll be history long before then. The Code is afforded legitimacy by the journals only because it serves them; if the Commission lets it become anachronistic the journals will desert it — or, if we’re lucky, they might pick and choose, following only those provisions of the code that suit them. Let’s not be overtaken by the rush of events. Eyes open, face into the wind. Let’s go. 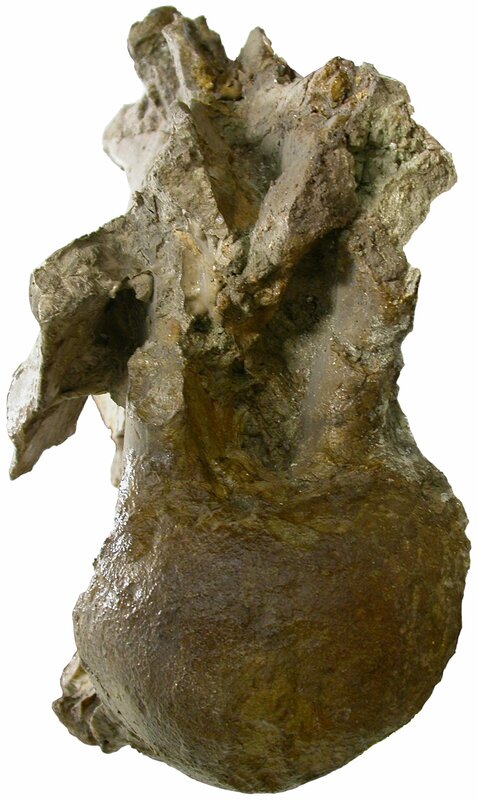 Finally, here is Cervical U of Migeod’s Tendaguru brachiosaur BMNH R5973, informally known as “The Archbishop”, this time in anterior view. Copyright the Natural History Museum. I think you make an especially good point about the value of distributing documents on the a network specifically designed to withstand a nuclear attack (and not just one strike either). I’d also add that open source means more non-specialists/non-scientists reading papers, which can only help the cause of science in general. Oh, and, as it deals with antics of puny human beings, shouldn’t this post be tagged “stinkin’ mammals”? I understand the desire to avoid over-using stinkin’ mammals, since it could apply to all posts (unless one of you three is a sauropod), but in this case it is particularly apt because the post is about some stinkin’ mammals who are especially stinkin’. Same kind of reasoning as applied to Aetogate. Still, it’s your blog and I’m just a grateful recipient of your knowledge, wisdom and, perhaps most of all, sheer joy of learning about the blog’s namesakes. Hey, Mike from Ruardean, what kind of response did your mini-rant get on the ICZN list? I suspect that a lot of people were like me–“PREACH. IT. Brother Mike!”–but I can also imagine that some folks had their heads in the sand (and if you the reader are one of them, yes, that is how it is). Report, please! Nothing. Literally no response whatsoever from anyone at all. Strange but true. Weird! Have there been any posts on other topics? Maybe you won the ICZN, and they just shut down for lack of any reason to post anymore. No, there have been a shedload of posts on the ICZN list, some of them on similar subject — but not a single one in response to my rant. I suspect there are just a lot of heads in the sand about the inevitability of open access, and the reality of digital documents. Kudos on a thought-provoking post. Thanks, Andy. The more I think about this, the more stupid it seems to me. As you no doubt know, the whole purpose of the World Wide Web, when originally invented at CERN, was to provide a means for scientific publications to circulate widely and freely. The fact that the Internet of 2009 doesn’t do a much better job of that than it does (which is already pretty darned good!) is purely due to the artificial barriers imposed by publishers, rather than any intrinsic failure of the infrastructure. favouring the self-organised version of distributing lots of copies of the same contribution among colleagues. btw, why just talk about pdfs, though? how about non-printable ‘lots-of-copies’? Claudia, you’re right — the text above is unnecessarily PDF-o-centric. I just talked about that format as it’s what’s mostly in use now, but the arguments apply equally when other formats are in use. Here, as is often the case, “PDF” is lazy shorthand for “digital representation of a published paper”. I would like to learn a ton here. Under (at least) US copyright law, people who have assigned copyright to somebody else (e.g. a journal) have an opportunity a few decades later to take it back. Most of us, of course, have not been publishing for long, but some have. A few high-profile withdrawals could do wonders for publicizing the open access problem. Is anybody old enough reading this? One important point in this article is that .pdf specs are published. You would *not* want to use .doc or something for any kind of archival or publishing purposes.